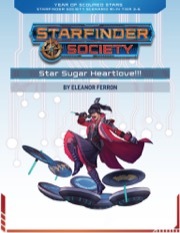 paizo.com - Starfinder Society Roleplaying Guild Scenario #1-14: Star Sugar Heartlove!!! 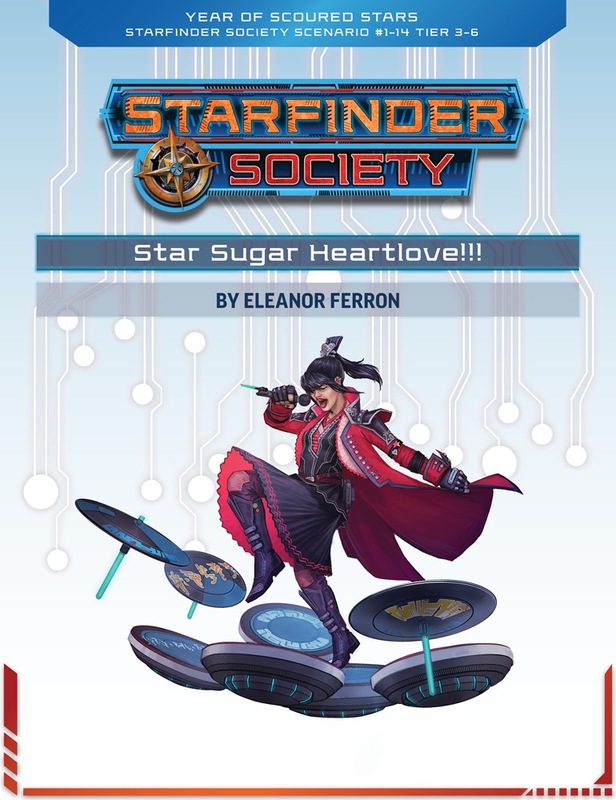 Starfinder Society Roleplaying Guild Scenario #1-14: Star Sugar Heartlove!!! This scenario starts with a ton of fun flavourful, short, social encounters (many of which have benefits other than the obvious). You get to chat up some friendly skittermanders, meet some superfans, and generally have a blast while going about a reconnaissance mission at the concert of the century. The first combat is fun, and the entire last section of this scenario? AMAZING! Epic! Over the top! Awesome! Any number of other positive words! It’s just a fun, exciting scenario that's totally wacky. I loved it! Star Sugar Heartlove is a weird scenario. On one hand, its a whimsical exploration of a concert for a fictional far-future pop group, having your team contend with (and assist) zealous fans and their unique problems. On the other hand, its kind of a conspiracy thriller where your team is trying to interrogate bad guys and avert a terrible catastrophe. And these two halves fit together awkwardly at the best of times, and sometimes not at all. Goofy, silly, and cute! But also tone-deaf, cringey, and awkward. Let's just say this scenario brings a very different take to the Starfinder Society, for both good and ill! It's uniquely light-hearted, especially regarding the mini tasks you accomplish. Particularly fun if your own character is an SMC fan! The final set piece, fighting a giant mech while the pop group sings to inspire you, is an awesome and memorable moment. The final encounter also has cool and unique attacks and powers. Tonally deaf, 1-14 introduces a Station-ending supervirus that'll kill everyone on the Station unless something is done about it in one scene, and then has you stop to help repair a goofy robot or trade merch with a superfan in the next. Damoritosh forbid you actually want to save the Station, because the adventure is written assuming you want to engage in all this faffing about even after you learn that everyone is going to die. There's no sense of actually investigating. Historia's initial briefing is just that there's a bad guy called Lanzio on the station somewhere, and you're given absolutely nothing that would help you find him. Locating him is a complete coincidence that stretches credulity. Ziggy, despite being the leader of the Exo-Guardians, the branch of the Society dedicated to the protection of the Pact Worlds, continues to come off as effete and incompetent. His sole contribution to this scenario is to be really hyped, dance a bit, and then get trapped inside a hallway (where incidentally the party is expected to leave him). With so many pages dedicated to the various concert ambiance scenes, Lanzio's encounter is empty. He immediately attacks, knows nothing useful, has nothing useful, and contributes in no way to the plot (his meager info is redundant with that gleaned from the reactor). The set piece at the end is awesome, but its also incredibly handwavy. Historia is able to manifest an alien computer virus into corporeal form so you can fight it??? I mean, yeah, cool! But this is a concept that really requires you to suspend your disbelief for the sake of a set piece. Although the day is saved at the end, nothing interesting is learned about the shadow-y corporate cabal that Historia is after, not even a teaser about their ultimate goals. Its pretty unsatisfying. I could write so much about how good this scenario is, but I feel words don't do this justice. Just play it. I'll try anyway. This scenario is so over the top weird, it's literally unlike any other scenario I've played. The author clearly had fun with the setting, and it shows. Nearly every NPC is interesting, memorable, funny, or a combination thereof. I have only one complaint, and even that won't be able to not warrant a five-star review. You're asked to subtly interrogate him. We spent quite a while thinking of a cover story to get him to talk, but in the end, he was scripted to break into a fight, through no fault of our own. I feel that's a bit of a shame. His backstory is interesting, but that's clearly being set up for later, which is also disappointing. I'd rather have that not be relevant and let that be a revelation in a future scenario, than to tease us with it and not do anything with it. As said, this scenario is cool, weird, and funny. This is a definitive must-play. I think it’s safe to say you’ve never played anything quite like Star Sugar Heartlove!!! before. It’s a really clever, light-hearted scenario that has a memorable climax players won’t soon forget. I ran this at Subtier 3-4 (with the four-player adjustment) and found that, although it was probably too easy and had a couple of technical flaws, the storyline was so much fun that any flaws could be overlooked. Admittedly, it won’t be to everyone’s taste and I wouldn’t want every scenario to be like this, but I’m really glad to see Starfinder Society trying out the wide-variety of tones available in the setting. This one alternated between hilarious and beautifully bittersweet, something I can’t think of adventures doing before. Try it so you know what everyone’s talking about! The gist of Star Sugar Heartlove!!! is that the PCs are attending a massive concert by the “sugar-pop” band Strawberry Machine Cake. When a secret agent working for a malevolent conspiracy linked to the Scoured Stars incident uploads a computer virus to kill everyone at the concert, it’s up to the PCs to uncover what’s going on before, in a dramatic finale, taking the stage to do battle with a holographic transforming mecha! The scenario starts with something I’ve asked for in previous reviews, and I’m glad to see implemented here: a briefing that’s more than the run-of-the-mill info dump. The PCs are on board a shuttle headed towards Songbird Station, the asteroid-temple devoted to Shelyn where the concert will take place, along with faction leaders Historia-7 and Zigvigix whose budding . . . something has been developing subtly for several scenarios now. Zigvigix is stoked about the concert and exited that the PCs are there to enjoy it with him, especially since too many of the friends he originally invited have disappeared within the Scoured Stars system. When Zigvigix heads into the shuttle’s cockpit to make final preparations, Historia-7 lets the PCs in on her ulterior motive for coming on the journey. She’s identified one member of the conspiracy linked to the Scoured Stars debacle and has tracked him to the concert. Because the conspirator, a man named Hira Lanzio, will be without his security entourage, it’s the perfect opportunity to kidnap him and pump him for information! Historia-7 doesn’t want Zigvigix to know about the secret mission, and only if the PCs press will she reveal that he’s been suffering from degenerative injuries and really shouldn’t be in the field at all. It’s all a really nicely done progression of subplots that rewards people who have been following along with the scenarios in order from the beginning. When the PCs get into the concert hall itself, their search for Lanzio is structured in a really interesting way. In essence, there are six mini non-combat encounters that they can experience, each of which might just be a fun role-playing opportunity, a chance to earn a boon, or a chance to get information about Lanzio’s whereabouts. My favourites include a couple of vesk teenagers who are outwardly haters of Strawberry Machine Cake (because they think hating whatever is popular makes them cooler) but secretly love the band; an “uber-fan” who has every piece of SMC merchandise except for the one thing a PC might have and trade them (a great pay-off of an earlier boon); and, perhaps my favourite, a security guard whose job is so completely redundant that he's depressed because of it. The idea with this last part is that the guard’s job is to check concert patrons for weapons and ask them to turn them over; but he has no legal authority to search or detain anyone, and is routinely ignored. To further his misery, there’s a magical field that prevents lethal violence being done within the concert hall, so even if he does collect any weapons, it’s probably unnecessary. And finally, he has merciful fusion seals to give out--but because of the magical field already in place, they won’t do anything! (and even if they did, they can be turned off and on easily!) GMs who play the guard as the saddest sad sack in the world should have a good time. (the one bit about this that I’m not sure was intentional or not is that, by the book, fusion seals take 24 hours to activate; there’s a big debate in the forums and I think clarification is necessary; if they don’t even activate in time for the concert to start, then the guard’s job is even more hilariously useless.) Anyway, these little encounters should end up with the PCs getting two crucial bits of information: Lanzio’s address (in the residential section of Songbird Station) and the fact that the station’s reactor cores are glitching and need to be stabilized or the concert might have to be cancelled. The take-down of Lanzio is pretty easy, as he’s a low-level Envoy guarded by one (or two) security robots. The PCs will probably be at full health and outnumber him and his entourage. There’s a bit of drama with him setting his computer to self-destruct and the PCs trying to stop the countdown in time (which, oddly, allows for Engineering, Computers, or *Mysticism* skill checks to stop), but unless they’re really negligent at adventuring, they shouldn’t have any trouble. Lanzio doesn’t say much, but does admit to putting a magical virus in the reactor core. PCs investigating the reactor core (before or after encountering Lanzio) discover that it’s infested with hespers. Hespers are fey who congregate near major power sources for motives that are as mysterious and alien as their origins; sometimes they help maintain and improve the sources, but sometimes they’ve been known to sabotage them to cause drama. This was an interesting encounter because the PCs could easily assume the hespers are to blame for the reactor glitches and go in guns blazing, and, even if they don’t, the hespers may try to mess with them in an ultimately non-harmful way (through their “mutating touch”) that might be interpreted as hostile by the PCs. Through either violence, diplomacy, or (in my PCs’ case) distraction and speed, the Starfinders have to extract a sample of the alien virus so that Historia-7 can analyse it and figure out what’s going on. I liked that the encounter had multiple ways of resolution. Assuming the PCs are successful, they’ll each get a chance for the spotlight and a shout-out while on stage. Holograms of Zigvigix’s missing friends are displayed, and there’s a really well-written wistfulness to the moment. I don’t know what’s going to happen next in the storyline, and I’m invested in finding out! Overall, there are a couple of nit-picky things that could have been improved (like the whole fusion seal confusion) but I wouldn’t let it detract from an awesome experience. If your players don’t get a kick out of this scenario, they are made of stone. As another review put it quite eloquently, Historia-7 is the star of the show here. Ziggy’s left in this awkward situation of dancing outside the concert hall (should the PCs watch them? Ignore them?) If the PCs decide not to check out the reactor they show up there, but even after reading the scenario multiple times I’m still not sure how they’re supposed to end up there. I had the pleasure of playing at author Elanor Ferron’s table, and her running Ziggy didn’t make it to the reactor – which was fine, because the scenario ran much smoother without it. So Historia-7 has determined that a member of the conspiracy hinted at in a previous scenario is coming to the SBMC concert, and it’s up to the PCs to find him and… ask him a few questions. There are a couple problems with this. First, every group I played with asked Historia-7 the basic questions – what this guy looks like, where are we most likely to find him at the concert, etc. Historia-7 has zero info for us – no description, no associates, no leads, nothing. The PCs are expected to walk around the concert asking random people if they’ve seen this secretive hitman/hacker/conspiracy member – and, perhaps even more strange, it works? The idea of wandering around a sold-out concert asking for a random guy (who almost certainly wouldn’t want to be found) borders on ludicrous. Second, after capturing Lanzio the PCs are supposed to make him talk. There are three problems here. First, Lanzio doesn’t actually know anything. To me 1-14, like 1-13, makes the mistake of having something that will undoubtedly be meaningful in future scenarios, but for the scenario to basically be about the thing (Lanzio’s information in 1-14 and the artifact in 1-13) the thing and really almost any information regarding it, isn’t anywhere to be found. Seriously, it’s actually surprising how little information the PCs can get out of him, which means the GM is left in this awkward position of, almost out-of-character, saying “no guys, you got it” or leaving the PCs to possibly torture/execute Lanzio because they don’t think he’s talking. Second, and related, the torture/execute situation (which arose in two of the three groups I was involved in) really broke my out of the flavor of the scenario for me. SBMC has this fun, silly, almost goofy feel to it, into which we have “enhanced interrogation techniques” being mixed in in the (VIP?) housing section of the concert. It felt really off to me. Third, Historia-7 instantly figuring out the most important thing on the wiped computer also strains the scenario’s believability. I get Historia-7 is amazing with all things technological, but come on – at least in other scenarios where the faction leaders do technological things outside of the PCs capabilities it takes place off screen in between scenarios, not instantly. I thought this part was a little bit confusing – the guard checking weapons is (unless I’ve misread it multiple times) outside of the reactor, which doesn’t make any sense because concert goers should be going into the reactor. When Eleanor ran this she put him outside of the housing section – which makes me think putting him in in front of the reactor is an error. Although I played all three games at subtier 3-4, the final boss went down surprisingly easy each time. In two of the three scenarios the boss got two turns, with it only getting to turn 3 on the third. Having not played at subtier 5-6 the difficulty could increase, but I was a little bit disappointed the final fight (or really any of the fights in the scenario) posed much of a challenge to any of the groups. To be fair, though, in all three of the groups I played with they were high subtier 3-4, with at least one, and sometimes multiple, party members playing out-of-subtier. Despite the complaints above, I love that there’s a SBMC scenario and had fun playing it. For the reasons above in the spoilers, though, I had a hard time really loving the scenario as much as I wanted. I feel like this warrants the addition of a Strawberry Machine Cake scenario tag. Just kidding. Maybe. Does it come with MP3s? But I'm always ready for more exo-guarding. Eeee! Been waiting for this tour since the release! Even though getting a VIP pass would be easy, it'll be nice to be able to enjoy the concert with friends. Don't worry Hissy, we won't let that conspirator ruin this grand occasion! Is it a performance stage? I hope it's a performance stage. Definitely had the right idea musically. That cover artwork! SMC are officially confirmed to be sci-fi Babymetal? It's an excellent image that we excitedly passed around the office when we saw it. Nicely done! I wonder if Abysshead is mentioned in the scenario. Rumor has it Strawberry Machine Cake does neo-psy-punk covers of the band A-ha. Just skimmed through this scenario, I'm incredibly hyped to run it. I would love it if Paizo made an official Strawberry Machine Cake shirt! tracking down the Scoured Stars conspirators mentioned in this scenario. They picked up on the fact that the computer virus potentially endangered the people on Songbird Station, including many innocent children, and are really eager to find out who these people are and bring them to justice (probably of the vigilante kind). Spoilers, man! This isn't a GM-only forum! I totally love it that the name of one SMC member is clearly based on Babymetal girls' names. That was a great touch! I'll write a real review after I run it, but for now I just have to say how much fun I had reading it. It made me laugh and and feel a bit sad at different moments, which isn't easy for a game scenario to do!